In our first Blog we posted about the importance and differences in rod selection. 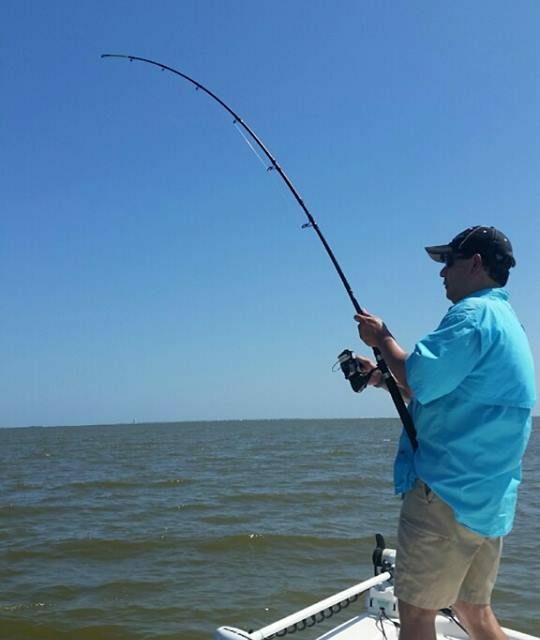 It may have seemed rather trivial to think that a rod was such an important aspect of the Galveston Bay fishing process right, but as you learned from our first post it is the backbone that connects you to the fish. Now we have to consider how do we get that fish back to the boat or shore for a complete catch. We have selected our rod and picked out our line but wait, what are all these reel differences? I thought I just pushed the button and cast? I was talking with my mom last night and she mentioned how she was looking forward to going to Galveston Texas bay fishing and she wanted “a cane pole”, oh my I thought how technology has complicated that process. As our anglers get more advanced and the bait/lures we use get more technical so do the reels. Now when we walk into a sporting goods store we are faced with so many options. We have spinning reels, baitcasting, offshore reels, open face reels, level-wind and nonlevel-wind. When did this get so complicated and why is any of it any better that a good old fashioned cane pole like my mom had when she was down in Surfside bay fishing? In this section I’ll try to group these into 3 basic categories baitcasting, spinning, and open face so we can simplify some of the selection process. Spinning reels are open face reels with a bail (small wire lock) used to unlock the reel so it can free fall line and cast. These reels are good reels for right or left handed anglers. They are very easy to use, one simply holds the line with their forefinger while releasing the bail and then cast out to the target while releasing the line. Spinning reels are capable of handling live bait and some lures. The line is open and on a spool that does not spin like other reels so it makes the possibility for tangles and other issues very unlikely. These reels are very forgiving and the go to reels for versatility of baits. You can land small to medium size fish with these reels and they are great for children. We use these reels for our guided fishing trips in Galveston and Freeport. Common complaints on spinning reels is casting distances and their limitations, and also line twist that can happen when not closing the bail properly after casting. However, even with the small limitations we find these reels to best suited for Galveston bay fishing guides and the Freeport fishing guides. Baitcasting reels are the pro’s reel of choice especially for our tournament charter captins. Having a much better drag system to handle larger game, larger spool to handle more line and typically a very high reel crank ratio to get your catch in with less turns on the handle makes it very good set up. Now, you’re probably reading this and wondering why we don’t recommend these reels for everyone and why they wouldn’t be used on the Galveston fishing charters. Let’s look at some of the drawbacks. They are every hard to cast, the angler must control the spool speed with their thumb to prevent the dreaded “birds nest”. Most beginners are not familiar with this and would spend more time correcting the issue than fishing, this is not what fishing guides want to see. Also, the maintenance on these reels requires them to be taken apart and cleaned every few trips to prevent salt build up. In addition to these issues, most baitcasters carrier a much higher price tag and therefore are not good beginner reels in our opinion or for charter captains. Lastly, we have are open face reels or offshore reels that we use on our Freeport offshore charters. Some of these are smaller and can be used for Freeport inshore guides use and actually one of my favorites for me personally. Like baitcasting reels used by our Galveston tournament guides they have very strong drag systems, allow a lot of line to be spooled and can cast very far distances. Also like the baitcasting reels the angler must control the reel speed with their thumb to prevent backlash. Many of these, especially the larger offshore series used on our Galveston offshore charters, do not have a level-wind which spools the line back across the spool evenly and this can cause additional complications if you are not familiar with it or don’t have an experienced guide to help teach you. Cheaper and more durable than bait casting reels they have become a go to reel for me but not recommended for beginners unless under the watchful eye of an experienced charter captain. With our first two posts we have reviewed some of your equipment choices for Galveston saltwater fishing. Next blog will start discussing different types of tackle used in Freeport fishing charters, Galveston Fishing charters and start talking about some of the knots commonly used in fishing by the experienced fishing guides. As always to learn about any of our fishing topics feel free to book a trip with one of our Galveston fishing guides and get all your questions answered first hand.